These wind catchers were an Earth Day project that got left behind. All you need is crepe paper, scissors, washi tape and sticks. Gather up your streamers and twist at one end. 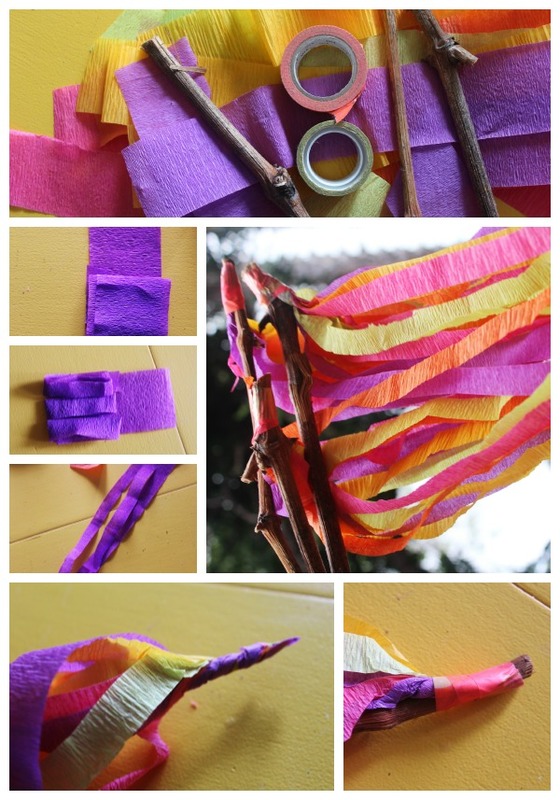 Hold streamers against stick and wrap a length of washi or masking tape around and around. We used sticks from a cut grape vine. Take your kiddos out on a walk to search for the perfect stick. They can even paint them up if you like. thank you! they are really fun and make a great sound when you shake them! I hope you and your girls got a chance to make some, enjoy! thank you very much for your wonderful ideas, they are easy to do and the children love it. Thank you for your thank you! I am always pleased when I hear feedback regarding one of my projects! I hope the children had a lot of fun!